Hello everyone: I have a super easy card to share with you that I will link to a few challenges at the end of this post. 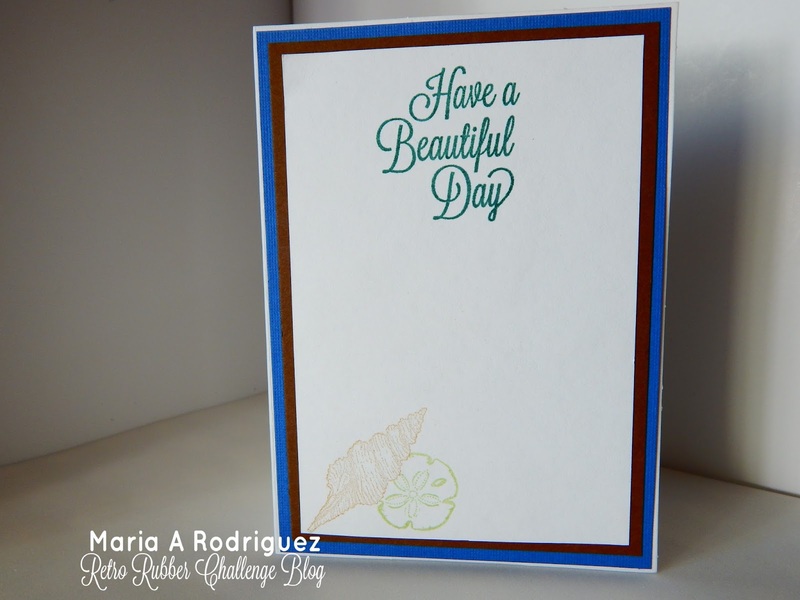 It's made with a stamp from Flourishes that dates way back to 2009!! I remember how much I loved this line of Acrylic stamps and I was fortunate to be able to buy a whole lot of them. 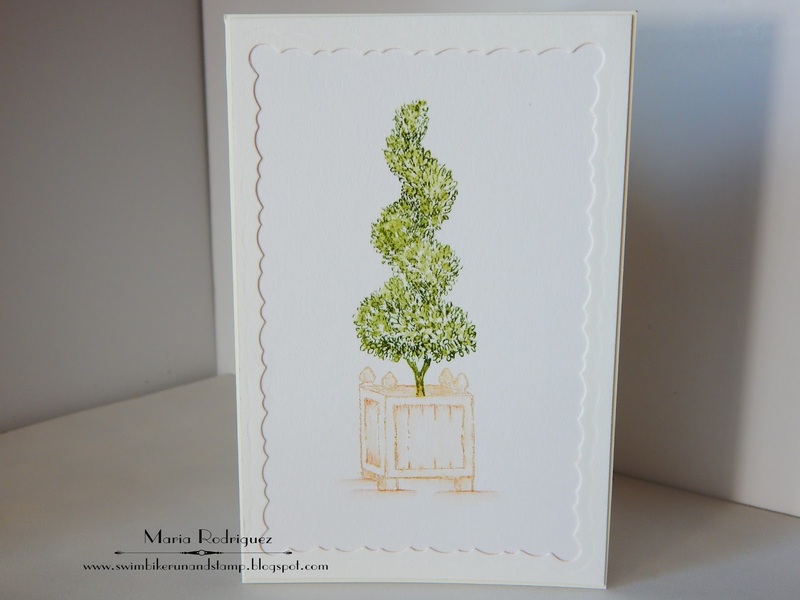 This stamp set is called "DIY Topiaries". The rest of the set has other containers and more beautiful Topyaries to choose from. I just stamped it onto a panel of Strathmore mixed media paper with Mossy Meadow and Old Olive for the foliage and a bit of Baked Brown Sugar for the container. I framed it with a left over piece from a die cut panel, I always save the "negative" pieces because they make pretty frames. I also went around with my aqua painter to mix the ink a bit. 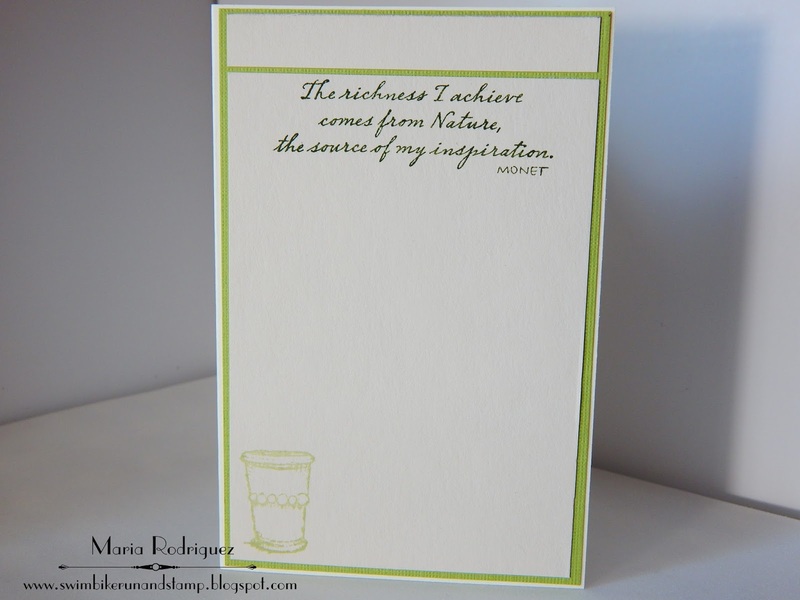 The sentiment is from another Flourishes set called ""Signs of Spring", the container from the Topiary set. Cards in Envy "Keep it Simple"
Crafting from the Heart "Anything Goes"
Unicorn Challenge Challenge #19 "Go Green"
The Paper Players Challenge #335 Color Challenge. 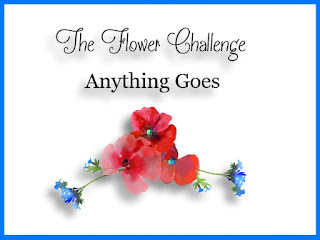 Hello everyone: We here at THE FLOWER CHALLENGE are at the half way point of this months challenge so I'm here to remind you that you still have some time to share your creations in the gallery. I made this card that I hope will inspire you to participate, with the "Anything Goes" theme you have the choice to create anything you want, just remember to have your floral image as the main subject on your card. 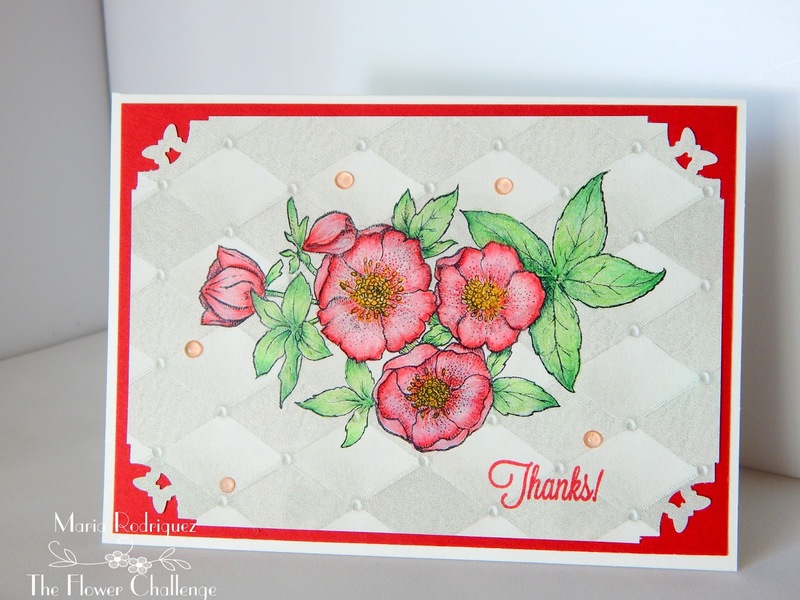 This image is from a retired Flourishes set called "Lenten Rose". I stamped it onto a piece of pattern paper from my stash, I saw a video from Therese Calvird and I thought it was really cool so, I decided to give it a try. My image is stamped with Stazon black ink and colored with my Prismacolor pencils. I added a few NUVO Jewel Drops for a bit of sparkle, this Drops come in a beautiful array of colors, they dry totally crystal clear. The corners were punched with a super old punch from Paper Studio. 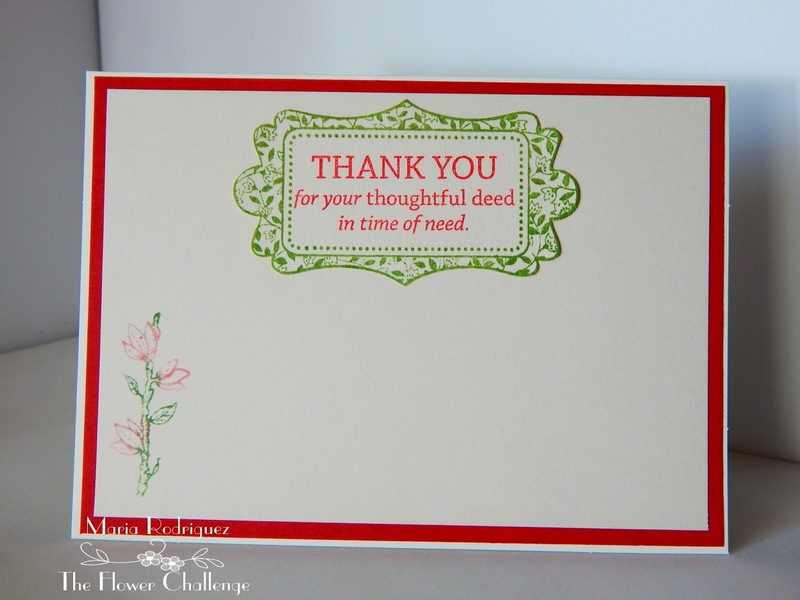 The sentiment is from a Flourishes set called "With Gratitude", the little image on the corner from the "Lanten Rose" set. Thank you for stopping by, don't forget to review our rules, they are few but important, then hop over to THE FLOWER CHALLENGE and check out the beautiful creations of my teammates. There is still time to play along, I hope you do. Thank you for coming to visit, I always read every single comment you so kindly leave on my posts, I want you to know I appreciate them more than words can express. Hello everyone: It's time once again to play along with us at SHOPPING OUR STASH where the theme is "Luck of the Irish"and we're inviting you to create a card using the color GREEN as your main color and that is why I chose this stamp set from Power Poppy called Sassy Succulents. Here is my card and I hope you get inspired to join my teammates and I in the gallery. I apologize for not putting my water mark there but for some reason my PC is not letting me, who knows why? I'm writing this post from my lap top and I don't have the water mark with my blog name saved in here. Anyway, this adorable little Succulents are so much fun to color. I stamped them onto a panel of Strathmore mixed media paper with Stazon black ink and colored with SU markers and my aqua painter. The pattern paper is from a (sadly) discontinued line from Lili of the Valley, the sentiment is from the set. The sentiment and the little succulent are from the same set. 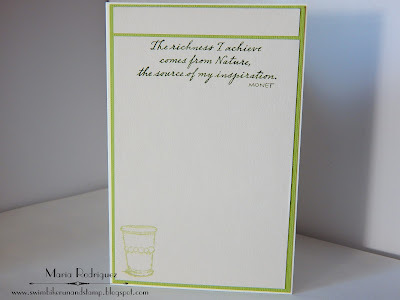 I hope you find some time to play along with us at SHOPPING OUR STASH, for more inspiration hop over to my teammates' blogs and check out their fabulous creations. 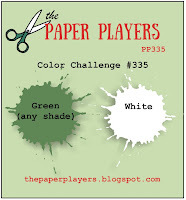 Hello everyone: Well, it's time for another fun challenge over at RETRO RUBBER, this time is one of the most popular ones.....ANYTHING GOES so, start your engines and get to your craft room, look for those old and neglected stamps that are older than a year and give them some inky love, then join my teammates and me in the gallery. Please, take a moment to read our rules, they are few and simple, we really get sad when we can't consider some beautiful cards for top 5 and a Guest Stamper spot because they were entered into a gazillion other challenges or the age of the stamps are not provided. Anywho, here is my card that I hope inspire you to join in the fun. 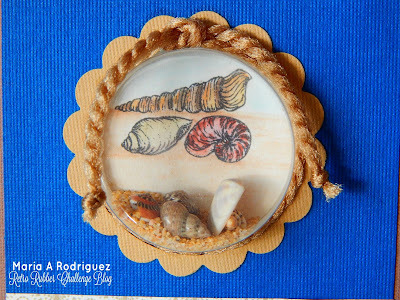 This Shells stamps are from a Flourishes set called Sea Side Life that was released in 2009 so I have it ever since. I found it on Cindy Laurence blog, this set is under the Strawberries set on her page. I still have a bunch of this deep shaker elements from Stampin' Up! from long ago, I don't quite remember when but they are fabulous for this types of cards. I stamped the small shells onto a piece of water color paper with Stazon black ink and colored it with SU markers and the aqua painter, then, I filled this container with actual sand and shells from Panama City, FL. collected by our beautiful grandchildren when we took them there for Spring Brake when they were little, those were magical times for the kids and us, their proud grandpa and grandma. The banner is from Spellbinders and the sentiment from a Stampin' Up!! set called "Curly Cute" from the 2010-2011 Idea Book and Catalog. Love this beautiful font. I took this close up picture of this beautiful shells my grandchildren gave us on those vacations. Some more beautiful shell images and a sentiment from another old Flourishes set called Tulips for Friends, if you scroll down on Cindy's page from 2013, you will see this beautiful set. I bought this set as soon as it was released. 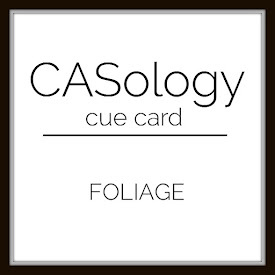 So, I hope this card inspires you to join us in our gallery. Don't forget to hop over my teammates blogs to see their beautiful creations.